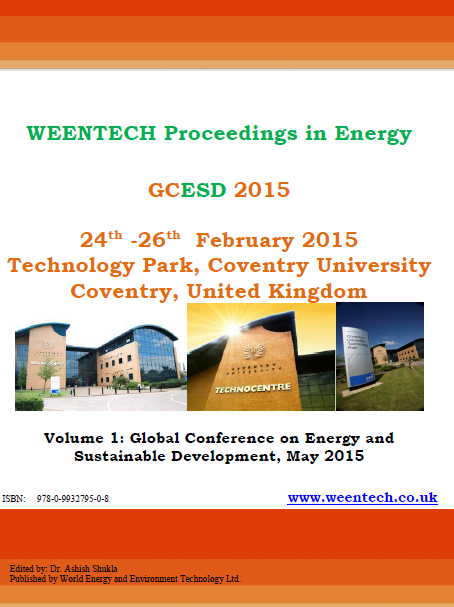 The GCESD2015 which took place at Technology Park, Coventry University Coventry, United Kingdom, 24-26 February, 2015 brought together a wider range of researchers, academics, industry experts, and students from 22 countries around the world. During three days about 40 talks from experts and researchers has been presented, providing diverse knowledge exchange between participants. The conference also showcased research work going on in the UK in the area and demonstrated their real world impact. The conference has been a great success and we thank all our participants, organisers and committee members for their valuable contributions. In today’s world we strive to reduce carbon emissions and work towards energy efficiency and sustainable development. Sustainable development can only be achieved by efficient resource utilisation, generation and use of renewable energy and improving user awareness towards low carbon life style. Reducing energy demand through informed choices and user engagement is important in this context. The “Global Conference on Energy and Sustainable Development-GCESD2015” highlighted progress that has been made around the globe towards energy efficiency, renewable energy, sustainability, resource utilisation and associate management and assessment methods. The presentations showed the depth and breadth of research across different research areas ranging from think film solar cells to sustainability issues in dams. It showed the real contributions and work going around the globe towards sustainable development.